Tickets are no longer available as this production has ended its run. Israel Galvan in La Curva. Photo by J. Fergo. BOTTOM LINE: You've never seen flamenco like this before. Israel Galvan shows us a side of the art form that combines elements of contemporary art, 20th century music and virtuosic dancing. Israel Galvan performs his new work “Israel Galvan’s La Curva” as part of the New York City Flamenco Festival. This is not your ordinary dance performance or what I was expecting to see from a flamenco show. He has taken the form and twisted it, modernized it and brought new light to a form where I pictured women in frilly skirts dancing to guitar music. Instead of a guitar, Sylvie Courvoisier plays the strings of the piano and the keys are as if her hands were jellyfish trying to shoot away from it’s prey but remaining fluid all the while. The more traditional sounding vocals by Ines Bacan have yearning and heart in it and she and the rhythm accompanist, Bobote Compass plays not drums, but a table. You have been invited into Galvan’s intimate world where all four artists onstage have equal artistry and every element is used to its fullest extent. Galvan starts off the show by knocking over a pile of chairs stacked over ten feet high as if to say that the destroyed heap is just as interesting as the stack itself. This feels like a breath of fresh air on the stage where the tradition is uprooted, but respected. 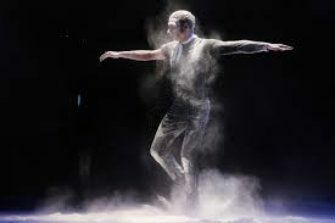 As his dancing continues across the stage, he moves from wood to metal to flour changing the sound of his feet as they pelt the ground like bullets. He is lithe like a cat in his lunges. His range and the versatility in his tenderness and strength of movement is seen when his hands move like Nijinsky’s in “Afternoon of a Faun” and then like claws or a shark fin when blood is on the trail. His feet move like lightning and trill as fast as the notes that fly from the pianist’s fingers. Galvan is obviously highly trained in many dance forms. He also is quite a musician tempering out complex rhythms by tapping on his teeth, flicking his leather jacket, playing a wooden chair, and pounding his fists into a metal table. "Israel Galvan’s La Curva" emits a fiery passion that is equally seen, felt and heard. In this flamenco show, I saw the mulling of tradition and contemporary ideas in the most thoughtful way I had ever seen. Coming from a family of flamenco dancers and tradition, who better to show us what can be done with the art of flamenco and where it can go from here?